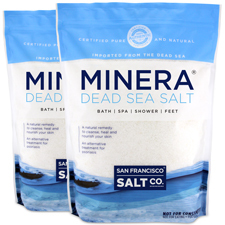 Known for its premium quality and many therapeutic uses, Minera® Dead Sea Salt is the purest and most mineral rich Dead Sea Salt available. It's the same Dead Sea Salt that has been used for years by spas and treatment centers around the Dead Sea in Israel. 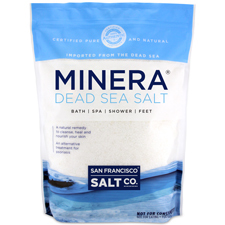 Minera® Dead Sea Salt dissolves easily in warm water to help detoxify, cleanse, heal and nourish your skin. Our Minera® salts are harvested from the Southern end of the Dead Sea where the mineral content of the waters is at its highest. The salts are delivered to our customers in their pure, raw form, containing all the essential minerals the Dead Sea is famous for.